If you comment on the border that says "Your forum, forum description, text of your choice, another text of your choice" don't bother receiving a reply. I have NO idea how to change that, but I'm working on it. I may change the theme (colours and appearance) of the site spontaneously, but not for a while. Another note, you can now have a title below your username and profile picture when you post. 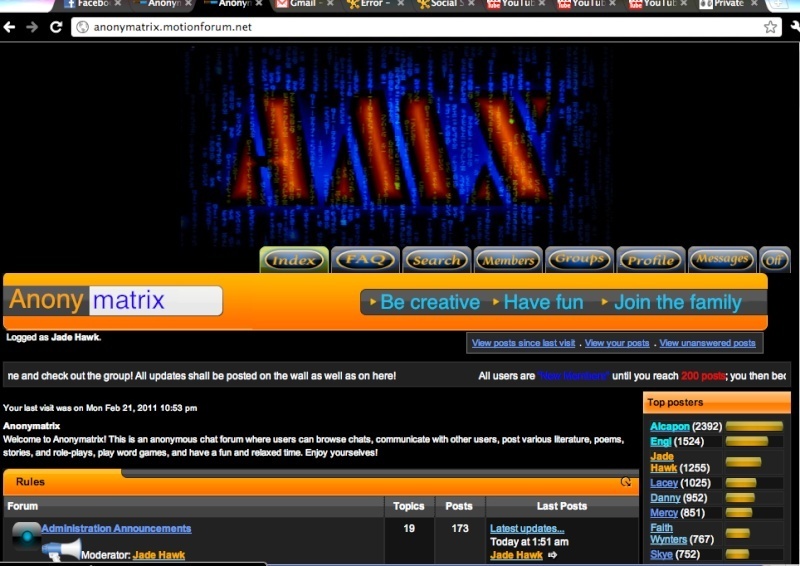 For example, mine says that I'm an admin and that I'm the creator of Anonymatrix. Moderators have the title "Moderator" below their name, but if you want something as random as "The crazy one", then contact me by e-mail or hunt me down on the forum as 'Jade Hawk' and ask and I should be able to set you up. Only one title can be owned per user. As well as titles, you may now have awards. These can be given to you as well as titles saying something like "Most active user" or "most popular" (when you have added the most friends). I am creating the award "Senior User" for those who exceed a certain number of posts, but if they wish to change this award name AFTER they have earned it, they most certainly can. You can only have one award at a time. If you wish to become a moderator, contact me by e-mail ONLY at anonymatrix@live.co.uk and I shall consider your promotion to moderator of the site after I have monitored your posts on this site. If you want to know the difference between a guest, and member, a moderator, or an administrator, please see the FAQ tab at the top of the home page, or e-mail me and I'll answer your questions. Applications for becoming an administrator is prohibited. It is not against the rules in any way, but don't waste your time because I will not grant you that wish. Again,if you have any comments, concerns, feedback, or questions, post them below or e-mail me at anonymatrix@live.co.uk (moderator applications must only be submitted by e-mail. There is no form to fill out, just send me a message). Did you know you can have friends and foes? You can add your friends as 'friends' on your profile. You will be able to access their profile easier and see the topics and replies they have posted. As well as friends, you can add foes. These are people who you block from receiving updates from, they can not contact you, nor view your profile. You can not block messages from moderators and administrators. 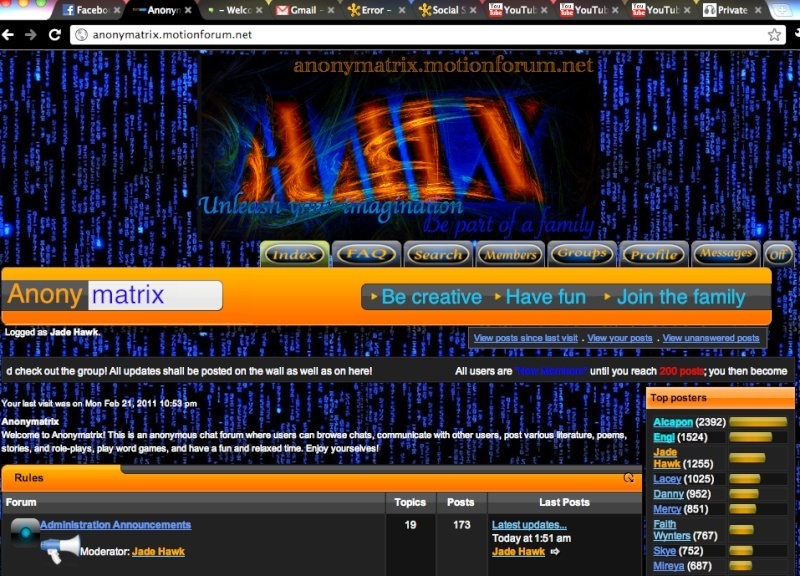 When you create an account on Anonymatrix, check your friends tab frequently. Some users might wish to add you as a friend, and you need to consent. You will probably receive a friend invitation from Jade Hawk, and you WILL receive one from Admin. I ask that you please accept the Admin friend request. You may find this useful in the future. You can not add Admin to your list of foes. The background images, site theme, and display may change at any time without warning! This will not effect the format of the posts, nor will it change any posts. I'm experimenting with personalizing themes using an HTML and bbtheme format. I apologize about my internet connection. If myself or Jade Hawk spontaneously sign out and do not reply to any messages or e-mails, the internet is down and I shall contact you ASAP. What are everyone's opinions on a newsletter? I have not yet decided how frequent I will send it out though. Is it worth the effort? Would you appreciate and read it? It would contain latest news and updates, announcements, state who's birthday are coming up, and give a list of current moderators and their positions. If the newsletter does come into effect but you are not interested, you can opt to not receive in your profile settings. The newsletter will be sent out by e-mail. If you have any award ideas or title requests, contact me via e-mail and we can discuss it together, as well as any comments or questions you may have. I have a One-on-one category for role-plays, and I have noticed three-on-three or two-on-two specified role-plays on the Anonymous Board on facebook. I shall not be creating specific categories for these types of role-plays. If you wish to post and participate in them, please post them in the group role-plays section under the appropriate category. If you have any category ideas, please see me. Keep checking here for new updates, the Welcome board for new visitors, and the Chatbox to see who is there. Please add or accept friends requests from 'Admin' and see who else wishes you be your friend (note: you can not add 'Admin' as a foe). People are starting to hide their online status, so I'm here to remind you to please NOT do that! Only the Admin can hid their online status. This is set up so the Admin can go around fixing the site without drawing any attention, and so users can at least pretend to be sociable. Being "hidden" doesn't make you any safer. The only people who can view IP addresses are the Admins. So... me. If you are hidden, I can still see that you're online. So a hacker will be able to get that address whether you're hidden or not. It makes no difference. And if you search for that IP address on google maps (or some equivalent) it doesn't track your server. It tracks your provider. So it wouldn't go to your house. It would only show the company building for whichever internet provider you are currently using. IP addresses have no effect on the computer you are using, whether you borrow a friend's or not. The IP address is the internet provider. I wouldn't stop you hiding if I thought it was unsafe. Trust me. If you're really worried about safety, you shouldn't be on the internet. Roxy has set up a security ring (ask her about it, not me) around our host, Forumotion. You are no safer hiding than you are actually being online at all. People can't track you by your online status easily. Just your posts. Your posts have a unique IP address depending on which network you were using at the time of your post. The Admin can view all the IP addresses that were used for POSTS ONLY at any time, whether you are online or not. If you are online and do not post at all, then there is not much to track. But don't be afraid to post. This may be a little forum, but it is quite safe. So being hidden doesn't effect security. There really isn't much to make it safer, other than deleting Anonymatrix out of existence. So if you decide to hide your online status, you have very little excuse. The Admin can see that you're online, anyway. So I will be changing your status from "hidden" to "online" without warning or notification. We have a "Like" button! Just like facebook, you can now "like" posts and replies. Click the + button in the top right of the post and a green bar will appear. This isn't just liking the post though. Whomever wrote the "liked" post will receive that "like" on their profile. Please be fair and don't continue to "like" a particular post more than once or find your friends and keep "liking" their posts for them. You can not "like" your own post. There is also a "dislike" button, but I'm trying to remove it. If someone posts that they have a bad day, "disliking" the post isn't the same as saying "Aww too bad". Disliking the posts lowers the number of "likes" this individual has overall, and it's basically demoting them. So just for now, please don't click the - button... hopefully it will be gone soon. This is NOT a popularity contest! If it becomes like one, I shall remove this feature. So a few of you might have noticed the slight logo change. I have 4 different options for you. The first it to have the first logo (I got the design off the Chatbox background) as our main picture at the top of the site, and keeping this blue matrix background. The second is having our old logo back, keeping the blue matrix background, and making no changes at all. The third is having the second logo at the top on the site, but changing the background back to black. The fourth option is using Al's logo design, but keeping the background the blue Matrix. What do you all think? And please be nice about it. I worked hard, and I'm sure Al did as well. I am not asking for design criticism. Just choose one of the four choices. Thank you. Second Logo has some 3D effect if you see it from a distance so that's awesome, plus add the slogan, and do as suggested as above. Also keeping the background as a solid matrix flow would look great with that one instead of the tiled version as it is now. Al, the choices are stated above. I'm not going to change them. Please pick one or two solid decisions. Thank you. Fine. Then i pick number two since it's th eone with less design flaws, or mine. But the back ground shouldnt be tiled if it is then i stick with just mine. Ooooo I like number 1 Only because it states the slogan, which I love! I like the second one. The Matrix background is too distracting for me. But I do love the first logo. Nice job on all of them, Jade and Al. Thank you! Yes, 1, 2, and 4 are mine. I'll leave this open longer to get more votes. Skye... which one are you actually choosing? I've made a few changes to the site today, some of which you might have noticed already. These are quite significant changes (not my usual mucking about with the pretty colours) so I thought I'd let you all know what I've been up to. The first change is I've added an automated word count to the reply fields. This applies to both the 'quick reply' and the 'post reply' areas, as well as when a new topic is created. A rule here at Anonymatrix is that all posts MUST be at least one full sentence. One word replies or a string of emoticons goes against this rule. You should all know of this rule as it has been a rule here for quite a long time, it is one which we most frequently remind users of, and you should all have read the rules page prior to posting. Sadly, this rule is being ignored often, so I have included a word count. You will not be able to send your posts unless they contain at least 4 words, each of those words being at least 2 letters long. This limit is tiny, as most sentences are much longer, but I felt I needed to start off this change small. Although this automatic post limitation is in place, it is still a rule that you need to follow and the wording in the General Rules topic has been adjusted to accommodate this new feature. This word counter also tracks the number of words you have typed over all, which some users enjoy following especially while posting stories or roleplays. The second change I've made is there is a new "Like" system. Our old one was a red and green ugly-looking bar on the posts. I didn't like the idea of being able to 'dislike' a post and I couldn't remove that from our old system, so I've completely changed it. The new "like" button is now on the bottom of every post. You can click this button to "like" someone's post, but you can only do this once per post and not on your own posts. Multiple people can "like" a particular post. This is NOT a popularity contest, this is simply to let a poster know that that particular post appealed to someone's interests without making a big fuss about it. Think of it as a "well done" or a pat on the back. The third change I have made is I have added a "save as you go" feature to the reply fields. After accidentally losing an essay today on Pastebin, I was very discouraged and after reaching out to my AMX friends, I realized that I was not the only person who has experienced this. This new feature remembers what you have typed, and if you accidentally refresh the page as you are typing a reply, the text field remembers what you typed and brings it right back for you to continue writing. I'm sure this will be a great relief to a lot of you. It certainly is for me! I do have some other changes planned that I'm hoping to introduce sometime in the future, so look out for those. Meanwhile, I hope you enjoy these latest changes and find them useful. Any questions about them, don't hesitate to ask! I'm not sure if this is the place for me to put this or not, but it goes along with the word counter at the bottom. If anyone is like me and they type most of their replies out on something else (like Microsoft Word for example) and you go and paste the reply in the quick reply at the bottom (same if you go through the 'Post Reply' option) you will notice that the counter does not count your words and will not let you reply. This is just a heads up for those who use this method, since the first time I tried to post and it didn't let me I freaked out a little bit . All you have to do is go to somewhere on your post and type a random letter (or space ect.ect.) and the counter will count your words and let you post. Not sure if anyone else will need the heads up, but I'm a Derp sometimes sooz I thought I would post that up. Oh, I didn't realize this! Thank you, Faith, for letting everyone know. I've just used our new "like" feature on that post!